The Coakley & Williams Construction project team, joined by school officials past & present, donors, Mayor Muriel Bowser and Councilmembers Brandon Todd and Brianne Nadeau came together for a ribbon cutting ceremony to celebrate its expanded Kay and Robert Schattner Center North Campus, which serves students in Grades 2 to 8, and to mark the establishment of the first dedicated Jewish middle school in Washington, DC since 1976. Founded in 1988 as the Jewish Primary Day School, the school thrived with the teachings of their Jewish heritage while encouraging and inspiring each individual student. Wanting to expand their reach to include middle school aged children, the school bought an adjacent property and through generous donations, this 2018 expansion was made possible. “As the school celebrates its 30th anniversary, the demand for a MILTON education continues to grow. MILTON’s newly expanded, state of the art facility is designed to provide a vibrant, cutting edge, creative education that encourages students to embrace new ideas while delving into our timeless traditions,” said Head of School Naomi Reem. The state-of-the-art facility at the North Campus features a Design Lab, two science labs, a Beit Midrash (traditional Jewish study hall), two libraries, studios for art and music, a rooftop playing field, a full-sized gymnasium, a new playground with a gaga pit, and many new, bright, inviting learning spaces from classrooms to common spaces. 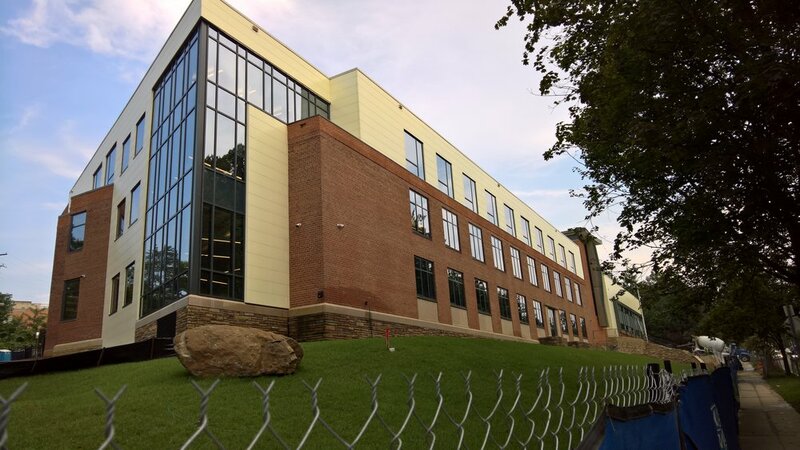 Coakley & Williams Construction and architecture firm Geier Brown Renfrow were hired for the 26,000 SF renovation and to build approximately 45,000 SF of new space to accommodate the brand new middle school. The LEED Silver certified project included major site improvements along the congested area of 16th Street, Fort Stevens Drive, and Rock Creek Ford Road, NW. Congratulations to the Milton Gottesman Jewish Day School of the Nation’s Capital community!